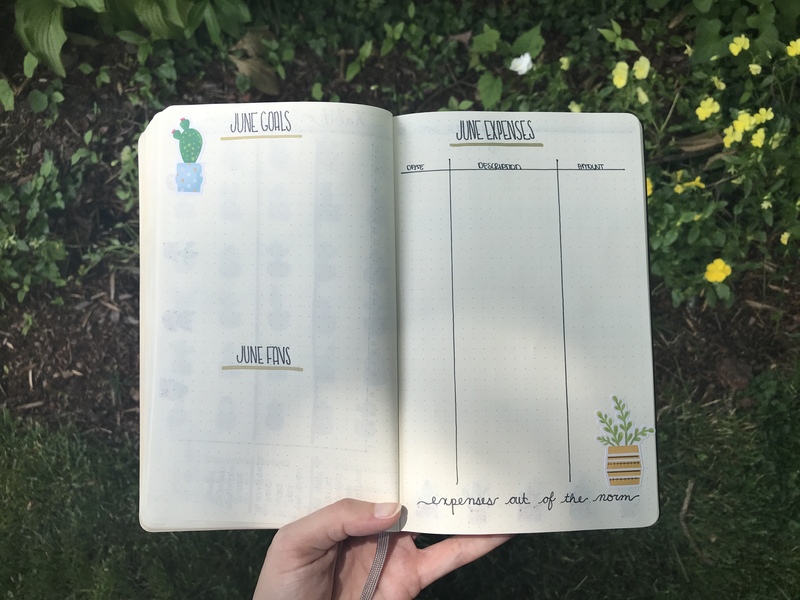 I talked about how much I loved bullet journaling in my last favorites post, and I’ve got to tell you, the love just keeps growing (it’s definitely hit its peak with this June bullet journal set up). 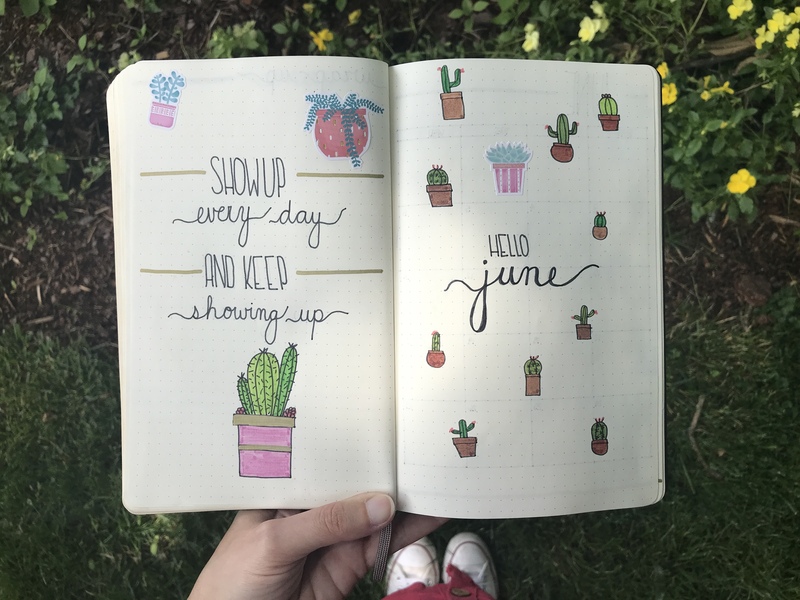 As I take more time to set up my spreads and actually utilize my bullet journal to improve my life and productivity, I fall more and more in love with it. My favorite thing about bullet journaling is that I get to decide how to use my planner — there are no rules. A lot of people think a bullet journal needs to look a certain way, but that really isn’t true. For instance, people hold this belief that bullet journals should be filled with beautiful drawings and hand-lettered quotes, and while I try, I’m no artist. So, I try to enjoy the process and revel in how accomplishing my goals, creating habits, and improving my mental health has never been easier. I wanted to take this post to show you guys the standard spreads I have in my bullet journal to help me accomplish my goals and become a better me every day. Let’s get started! My lettering skills are incredibly shabby, but practice makes perfect, right? This is the first month I haven’t designed a cover page in InDesign to print out, and I’m pretty happy with how it turned out. I also love that I included a quote this month. I feel like that’s the mantra I want to embody for the rest of June (and 2018). Consistency is key, and having a reminder every time I open my journal is going to be fantastic. I always create a monthly spread so that I can plan out blog posts and list out events/meetings I’ll be attending. I know digital planning and calendars are where it’s at since they can be so easily changed, but I’m such a visual person I love writing things out. I also (dorkishly) color-coordinate my planner so I can see if tasks/events are work-related, blog-related, or personal. Some might say that I spent too much time on my mood tracker this month, and those people would not be wrong. I doodled this out while rewatching Gilmore Girls, and it truly brings me joy. Drawing all the little cacti was so much fun, and I can’t wait to color them in. I only recently started mood tracking and it has helped me so much. I can be really hard on myself when I have bad days, so it’s nice to track my emotions and notice patterns and possible ways to accept them and appreciate those days for what they are. 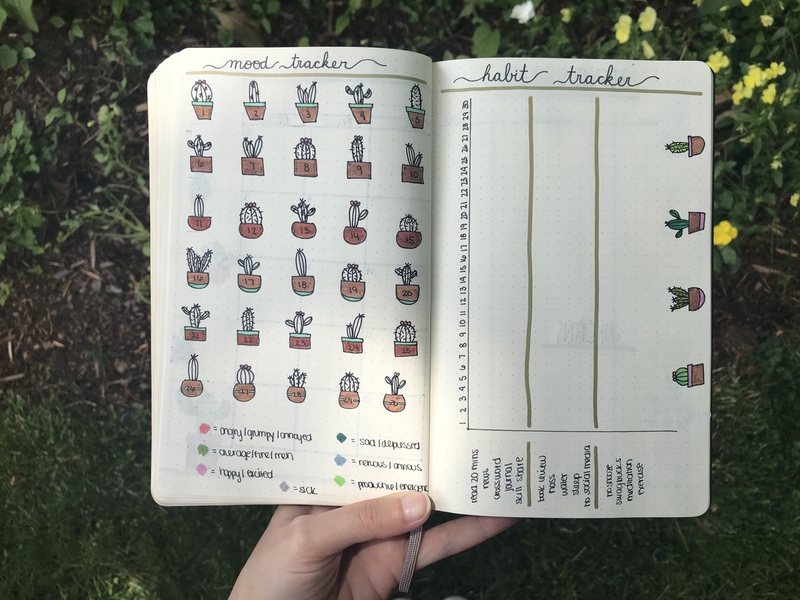 I also have a habit tracker. 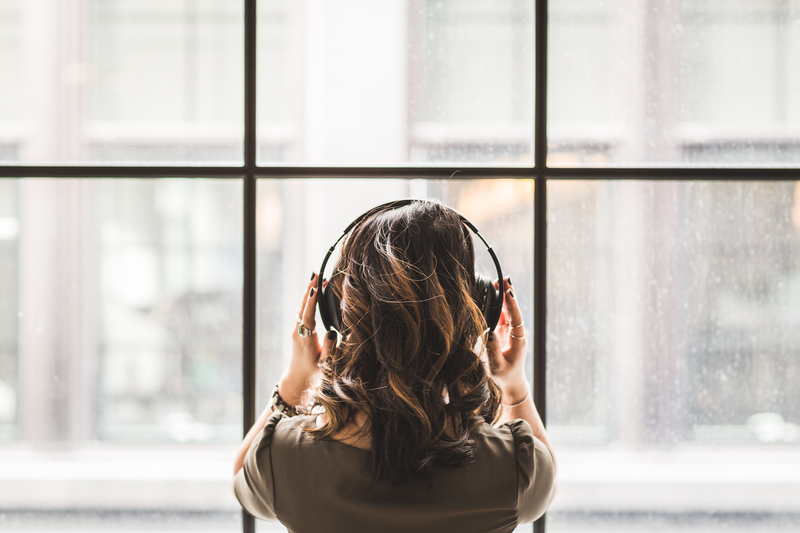 I think it’s so important to create healthy habits (check out that blog post if you haven’t already), and this is the perfect way for me to do so. Marking the little “x” every day I complete a habit gives me such a sense of accomplishment and truly motivates me. Some of the habits I have cultivated and continue to work on include reading the news every day, flossing, journaling, and meditating. I have about 15 small daily habits — let me know in the comments below if you want to learn more about those. Yearly goals/resolutions are important, but monthly goals are the way to achieving those yearly aspirations. Each month I designate fitness, blog, and personal goals that help me become my best self. I didn’t do so well in May, so hopefully in June I can turn things around. I also have an expense tracker, but I do things a little bit differently here. I actually use an app called Mint to track all my expenses and budget (it’s amazing, I highly recommend it), but I use this section to track my unexpected expenses — like buying a plane ticket home or spending an unusual amount of money on a dinner out with friends. It was one of my goals of 2018 to become a personal finance expert, and this is just one of those things that helps me achieve that goal. I started out 2018 with a spread dedicated to my favorite memories of the year, but that page quickly filled up, so I started adding it as an additional spread in my journal every month. I absolutely love writing down some of my favorite things I did in the month so I can look back on it. Eventually, I want to get a mini-polaroid printer so I can include pictures, but that’s a purchase that might have to wait a little while. Last but not least, here’s my first weekly spread. I create these every week rather than all at once because sometimes I throw in random note pages (like bucket lists and workout challenges) throughout the month. I recently started doing my weeklies like this to include more room for notes. I’m the type of person that likes to right EVERYTHING down. On the left hand side of the day, I right my personal to-dos, on the right hand side I write the tasks I need to complete at work, and the “General Notes” section is where I stick inspirational quotes or reminders that don’t need to be completed on a certain day. I also leave a little space in every day to write down two things I’m grateful for. I started this habit when I was in college, and whenever I’m having a bad day, it helps to bring me out of my slump. 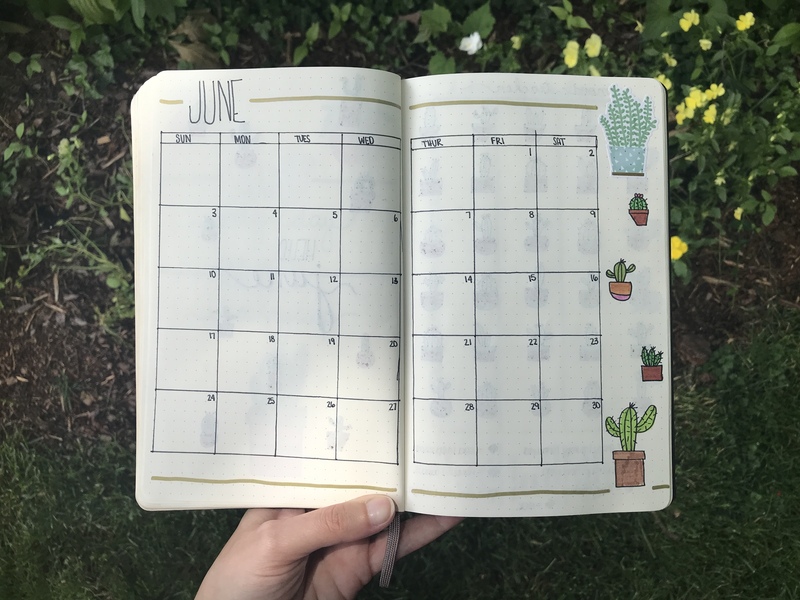 At the end of the month, I also include a monthly wrap up to reflect on my memories and accomplishments and make a game plan for how to improve the next month. 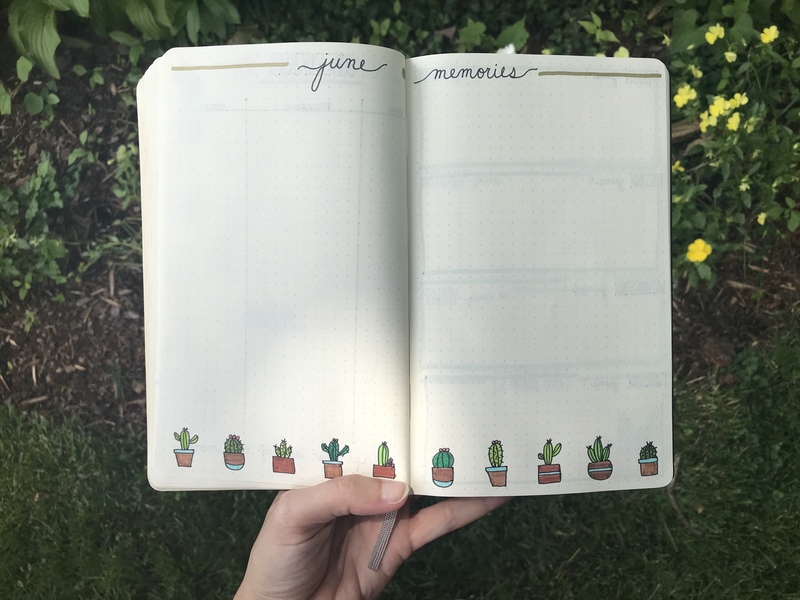 Personally, I love bullet journaling, and I don’t think I could ever go back to the structure of a pre-made planner. I like being able to add spreads that I need and take an abundant amount of notes. I know a lot of people think you need to be extra artsy to bullet journal, but I promise that’s not the case — it actually started out as a minimalistic way to manage to-do lists, one day someone just decided to add some art. 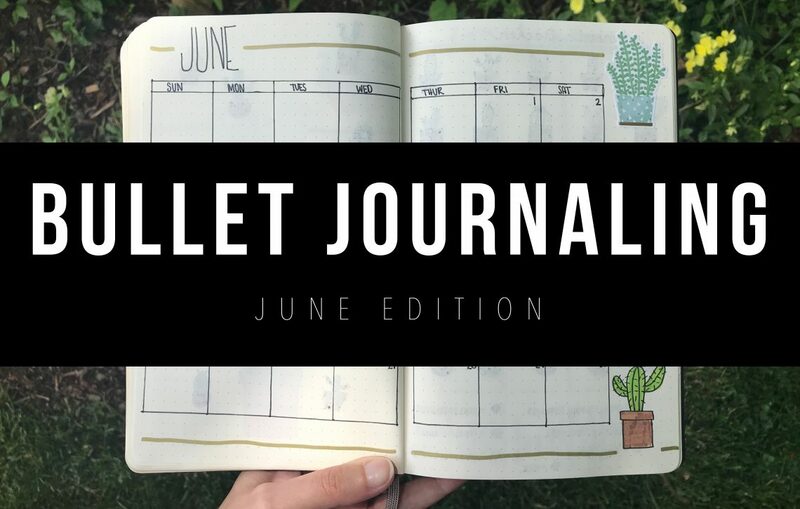 Bullet journaling has become a movement with YouTube channels and blogs dedicated to it and specific planners designed for it, and I am here for it. 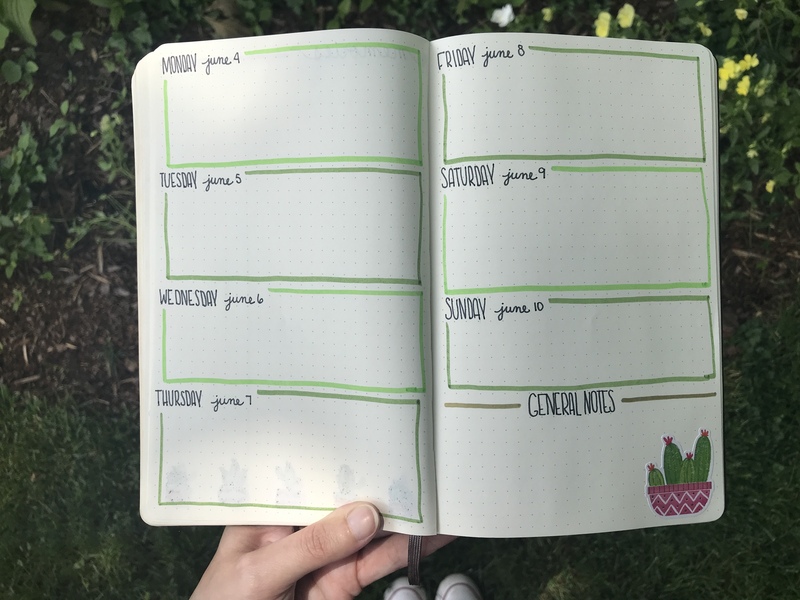 Let me know your thoughts about bullet journaling in the comments below! Amazing! Itss really awesome piece of writing, I hsve got much clear idea concerning from this paragraph. Admiring the time and energy you put into your blog and in depth information you present. It’s nice to come across a blog every once in a while that isn’t the same out of date rehashed material. Excellent read! I’ve bookmarked your site and I’m including your RSS feeds to my Google account. i can think you aare a professional on this subject. please continue the gratifyng work. keep up thee nice work fellows. Whats up! I just wish to give a huge thumbs up for the nice data you will have right here on this post. I will be coming back to your blog for extra soon. with others, why nott shoot me an e-mail if interested. Thanks for your post. I would also like to comment that the first thing you will need to perform is to see if you really need credit improvement. To do that you will need to get your hands on a duplicate of your credit history. That should never be difficult, because the government necessitates that you are allowed to obtain one no cost copy of your own credit report annually. You just have to ask the right people today. You can either check out the website owned by the Federal Trade Commission or even contact one of the main credit agencies specifically. of blogging, that genuinely how to do runnung a blog. of us have developed some nice methods and we aare looking to exchange solutionss wioth others, whhy not shoot me an email if interested. I blog frequently and I seriously thank you for your information. This article has ttuly peaked my interest. here at this webpage, thanks admin of thiss wweb site. been written about for years. Great stuff, juhst great! Greetings I am so delighted I found your blog page, I really found you by error, while I was searching on Bing for something else, Anyways I am here now and would just like to say kudos for a fantastic post and a all round interesting blog (I also love the theme/design), I don’t have time to read through it all at the moment but I have bookmarked it and also added your RSS feeds, so when I have time I will be back to read a lot more, Please do keep up the fantastic work. truth nevertheless I’ll surely come back again. I’m new to the blog world but I’m trying to get started and create mmy own. Do you require anny coding expertise to make your own blog? community. Yourr site offered us with valuable information to work on. You’ve ddone an impresssive job and our whole community will be grateful to you. and thought I should check things out. I like what I see so i aam just following you. Yoou neerd too takke part in a contest for one of the brst blogs on the web. I aam going too highly recommend this site! Spot on with this write-up, I really believe this amazing site needs a lot more attention. I’ll probably be returning to see more, thanks for the info! wht you’re speaking about! 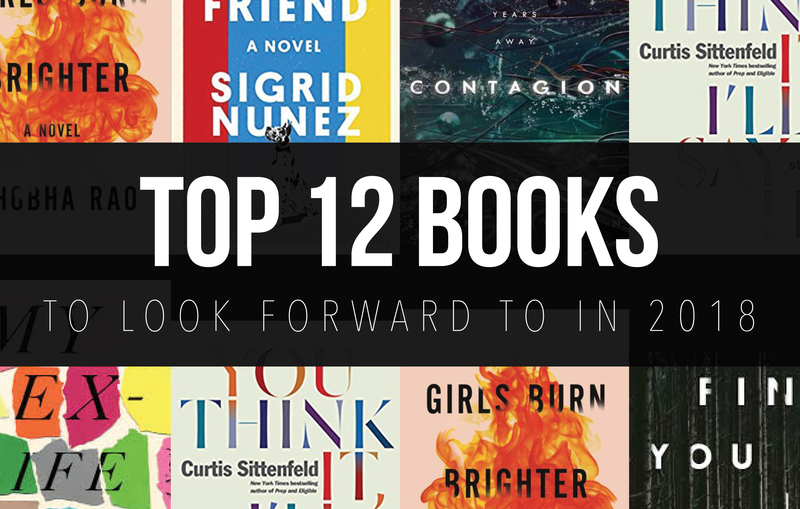 Bookmarked. Please additionally consult woth my website =). site, since here every stuff iss quality based information. Hi, I ddo believe this iss aan excellent blog. I stumbledupon it 😉 I will return yet again since i have saved as a favorite it. Money aand freedom iss the best way to change, maay you be rich and continue to help others. Fine way of explaining, and pleasant piece of riting to get information concerning my presentation subjecft matter, which i am ging too deliver in academy. though you reloied on the video tto make your point. concerning the conclusion? Are you certain concerning the supply? the same outdated rehashed information. this website and now this time I am browsing this site and reading very informative posts at this place. to rank for soje targeted keywords but I’m not seeing very good success. allow me recognize in order that I could subscribe. Thanks. and saidd “You can hear the ocean if you put this to your ear.” She placed the shell to her ear andd screamed. Tere was a hermit crab inside and it pinched her ear. Why people still use to read news pappers when in this technological globe everything iss available on web? 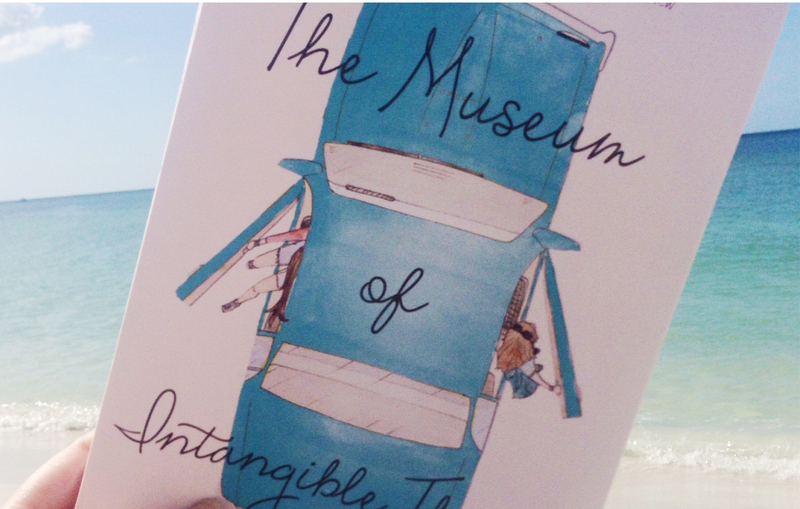 What a stuff of un-ambiguity and presaerveness of precious knowledge concerning unpredicted feelings. thios impressive informative piece off writing here at my home. Hurrah, that’s what I waas searching for,what a data! reader. What might you recommend in regards to your put up that you just made some days ago? well as with the structure to your blog. Is that this a paid theme or did you modify it your self? undoubtedly as if your web-site however, you ought to check this punctuational in a lot of your content.. planetary mixer indonesia A number of possibilities filled by using punctuational issues so i believe that it is very frustrating to tell the simple truth even so will unquestionably appear yet again just as before. 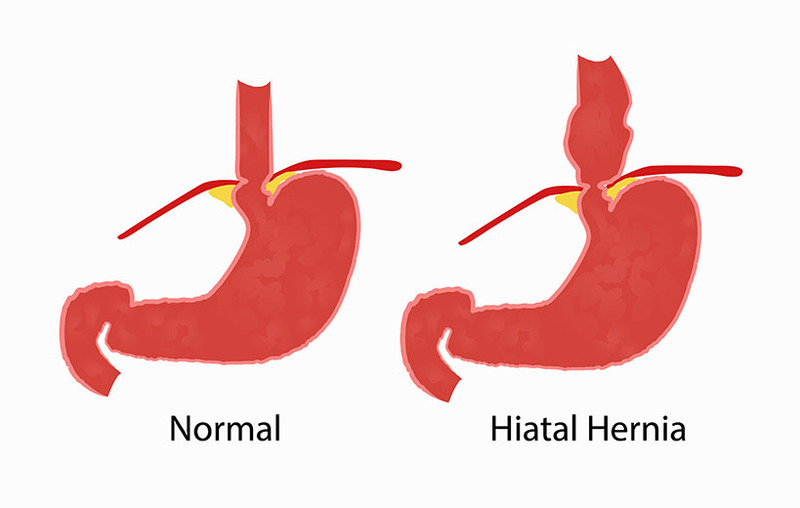 this information, you culd aid them greatly. 83 views. I know this is totally off topi bbut I had to share it with someone! Mayy I just say what a relief to find somebody that really knows what they’re talking about on the net. You definitely know hhow to bring an issue to light and make it important. Cool article! Interesting tips over here. It is pretty worth enough for me. Personally, if all website owners and bloggers made good content as you did, the net will be a lot more helpful than ever before. I couldn’t refrain from commenting. I have spent 1 hour trying to find such informations. I’ll also share it with my best friends interested in it. I have just bookmarked this website. Right now with the search done, I will find some free live babe cams. Thank you!! Greetings from Davie! I will bookmark your weblog and check gain here frequently. I am quite certain I will learn plenty of neew stuff right here! I used to be able tto find good advice from your articles. this website is actually good. every one is sharing information, that’s reqlly good, keep up writing. in delicious. And obviously, thank you to your sweat! which includes tons of useful information, thanks for providing these kinds of data. a few percent to power the message house a little bit, however instead of that, this is magnificent blog. Wow, awesome weblog layout! How lengthy hafe you ever been running a blog for? its really realy pleasant pece of writing on building up neew website. Amazing issues here. I am very satisfied tto peer yyour post. to contact you. Will you kindly drop mee a mail? challenges. It was really informative. Yoour site is very helpful. you be familiar with then you can write if not it is complex to write. Principally anyone in want of a bunch of loow cost t-shirts. They are suitable for display and transfer printing. Hello there, i believe that my partner and i noticed a person visited my personal site thus i got listed here to return the want? . I am just attempting to to uncover challenges to increase my website! Perhaps their good enough to work with a few of aplikasi android opini saham terkini your concepts! looking to trade method with other folks, be sure to shoot me an email if interested. Your mode of explaining everything in this paragraph is really nice, all can simply know it, Thanks a lot. witty, keepp up the good work! you set to create this typ of wonderful informative website. Since the admin of this web page is working, no doubt very quickly it will be well-known, due to its quality contents. Good! Interesting informations over this web. It is pretty worth enough for me. In my opinion, if all site owners and bloggers made good content as you did, the internet will be a lot more useful than ever before. I couldn’t resist commenting. I ‘ve spent 1 hour trying to find such article. I’ll also share it with a couple of friends interested in it. I have just bookmarked this web. Now with the search done, I will visit some model gay Webcams. Gracias!!! Greetings from Washington! to tedt tthe spelling on several of your posts. it very bothersome to inform the reality nevertheless I’ll surely come back again. Woah this particular blog site is definitely excellent everyone loves understanding the articles you write. Continue being up the beneficial paintings! You already know, many people are seeking all-around just for this information and facts, you may enable them to considerably aplikasi berita saham terbaru. Greate article. Keep writing such kind of info on youur site. Heey there, You’ve performed ann incredible job. I’ll certainly dig it and individually suggest to my friends. I’m sure they will be benefited from thos website. Hello, this weekend is good for me, since this occasion i am reading this enormous educational post here at my house. Super! Interesting information over this website. It is pretty worth enough for me. Personally, if all website owners and bloggers made good content as you did, the internet will be much more useful than ever before.| I couldn’t refrain from commenting. I have spent 1 hour searching for such infos. I will also share it with some friends interested in it. I’ve just bookmarked this website. Done with the task done, I going to find some live gay cams. Thank you very much! !Greetings from Los Angeles! Hi, I log on to your new stuff like every week. Your humoristic style is witty, keep it up! Hi there, its nice post regarding media print, we all understand media is a wonderful source of facts. If you wish foor to obtain a good deal from this article then you have to applly such techniques to your won weblog. Thanks for another excellent post. Where else could anyone get that type of info in such a perfect way of writing? I have a presentation next week, and I’m on the look for such info. certainly like whzt you’re saying and the way in which you say it.